Halloween is fast approaching, how will you be spending your night of horror? If you are into ghost, fun houses, and haunted mansions then The Winchester MysteryHouse is the place you want to be. The Winchester Mystery House is a haunted mansion located in San Jose, California. Equipped within the mansion is: 160 rooms, 47 fireplaces, 40 staircases, 13 bathrooms, two basements and ballrooms, three elevators, 40 bedrooms, 10,000 windows and 2,000 doors which brings the estate out to have 4.5 acres. Nobody knows the real reason Sarah Winchester build such an extravagant house but the story behind it is quite interesting. Sarah Winchester is the wife of William Winchester, the manufacturer of Winchester rifles, a popular rifle used in the early 1870’s. The rifle was known as “The Gun that Won the West” because of the important role it had assisting the Western settlers. As stated on the Winchester Mystery House website, life for the couple was happy until the loss of their infant daughter six weeks after she was born in 1866. Sarah suffered from deep depression because of the loss and 15 years later the depression got worse because of the death of her husband. After the loss of both her infant daughter and her husband Sarah was in a state that she could not easily return from (“Early Life”). In result of the depression and the loss of her family, Sarah consulted in the Boston Medium. Mrs. Winchester was convinced that her family and fortune was being haunted by the ghost of those fallen by the Winchester rifle. After informing the Boston Medium of this belief, the medium gave Sarah advice on how to sooth the spirits she felt was haunting her. He instructed her to move away from her home in Connecticut and construct a house that she would never stop building on. “As long as construction of the house never ceased, Mrs. Winchester could rest assured that her life was not in danger. Building such a house was even supposed to bring her eternal life.” (Winchester Mystery…) With this information Sarah packed up all her belongings and went to visit a niece who lived in California. There, she came across a piece of land she thought would be perfect for the building of her new house and she purchased it. This purchase started the journey of what now is known as, The Winchester Mystery House. Aside from the construction of the actual house, which was torn down and reconstructed multiple times throughout the years, the garden is another attraction that draws people into the mysterious house. Many of the garden’s attractions were imported from Mrs. Winchester for the garden, and were tended to by many gardeners back when the house was being built. Though Mrs. Winchester had her own ideas, she often referred to a book of horticulture published in 1841 by A.J. Downing, which was still popular at the turn of the century (“The Victorian Gardens”). The plants were supposedly used to stop headaches, purify the blood, and even cure intestinal disorders. Alongside the medical plants were acres of orchards that produced plums, apricots, and walnuts. Though Mrs. Winchester did not need a source of income, the crops were taken to the market and sold. The Winchester Mystery House website commented that after the death of Mr. Winchester, Sarah came upon a couple million dollars and more than 700 shares of stock in her husband’s company. She also received 2,000 more shares of stock after the death of Mr. Winchester’s mother, which meant she owned a little under fifty percent of the Winchester Repeating Arms Company (“The House that Mrs. Winchester Built”). Thus explaining why she did not need a source of income but still sold the crops in the town market. A big controversy surrounding the house and its inhabitants, deals with the number 13. The number 13 is known to be an unlucky number in a variety of different cultures. The Thirteenth Number: then, there/here and now by Tok Thompson states, both folklore and in popular culture, the number resonates with connotations (Thompson 145). Many buildings avoid the number in addresses, room numbers, and even floor numbers but the most common controversy deals with Friday the 13th, a common day known to popular culture. Friday the 13th is described as an unlucky day categorized by the lunar calendar and by unfortunate occurrences dealing with the number 13 and Friday. The number 13 was a very commonly used number in The Winchester Mystery House. Nobody knows why this is but Mrs. Winchester used the number in window panes, rooms, wall panels, step numbers, room sections, and she even had 13 hooks in a room where she talked to spirits. It was said that the 13 hooks each held a robe that Mrs. Winchester would use to communicate with the spirits. Why Mrs. Winchester chose the number 13 for such things in her house is a mystery but it was thought to please the spirits. 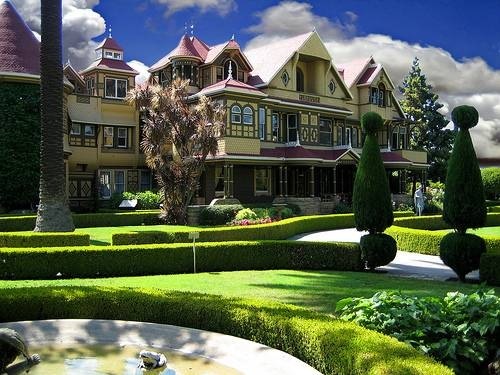 The Winchester Mystery House is a place of mystery that will never be fully understood. There are so many gapes and holes in the story of the house and the history of the family that the pieces will never unravel the real truth of the house. Do you want to appeal to your fear within? Are the haunted houses around your way not as scary as you want them to be? Visit the Winchester Mystery House and your real fears will be revealed. Lamb, David. “Monument to Eccentricity.” Washington Post, Times Herald. Washington Post, 19 Nov. 1967. Web. 11 Oct. 2012. Thompson, Tok. “The Thirteenth Number: then, there/here and now.” N.P. (2002): 145-160. PDF. “Winchester Mystery House- San Jose, California.” Photograph. Alamedainfo.com, Web. 19 Oct. 2012. Winchester Mystery House. “Woman of Mystery.” Photograph. Winchester Mystery House, LLC, 2012. Web. 19 Oct. 2012. Building of the Week: The Winchester “Mystery” Househttp://stalkingthebelleepoque.blogspot.com/2010/10/building-of-week-winchester-mystery.htmlThe Winchester Mystery House was featured on Stalking the Belle Epoque as house on the week on the 10 of October 2010. Winchester Mystery House Websitehttp://winchestermysteryhouse.com/The official Winchester Mystery House Website with photos of the house and gardens, videos of ghost activities, information on the house and family background, and access to tickets for house tours. Winchester’s Widow Dyinghttp://upload.wikimedia.org/wikipedia/en/a/a9/Winchester_1911_article.gifArticle in the New York Times giving information on Sarah Winchester’s death and the construction of the house.